I Think we are at the end for Porcini and Cantharellus? What do you hunt for now and in the winter? Any suggested spoit for them? Never found them in uk!! velvet shank ,flammulina velutipes,usually these bloom once the weather is quite cold ,the caps are lovely in stews,sauces etc .dont bother eating the stalks as the texture is not nice. they grow on a few types of tree but seem to taste best on beech .easiest to pick with a knife. and what about Saffron Millkcap? I tend to find them around the edge of where Scots Pines are growing, but I don't often see them about. Having said that I think I've got a patch growing in my woodland but I need to do a bit more research before I try eating them. Don't give up on Ceps yet. Found these giants less than two weeks ago, & in the past have found the odd one close to Christmas providing the weather is not too cold. I've found a few saffron milkcaps in the past - they are meant to be more common in Scotland than down south. Nothing more near than scotland? You need to look under pines or spruce - lots in Scotland, but found elsewhere too of course. See what you can find. The only (very few) times I've found them it was slightly earlier in the year - but given the mild autumn you could be lucky. Saffron milk caps are not winter species. They are coming to an end now. Loads grow around here, but I haven't seen more than the occasional one for a few weeks. 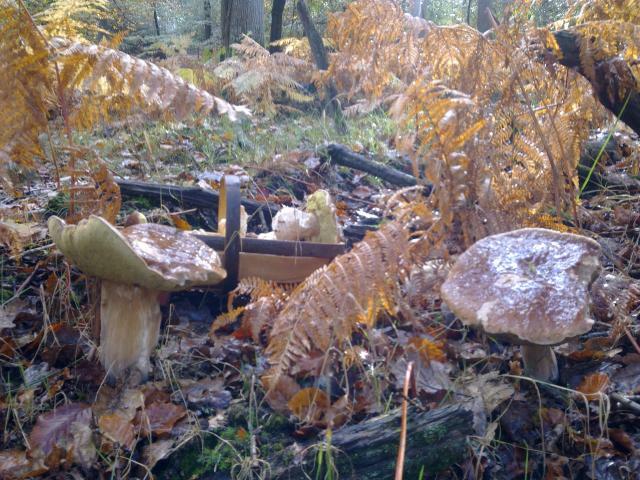 anyone stil found some boletus?